Helichrysum (also called Immortelle or Everlasting) is one of my favourite essential oils. 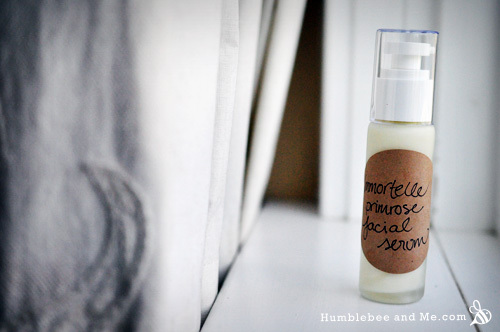 I love its soft, herbal/floral scent and its wonderful healing properties. The pretty yellow flowers of the Helichrysum italicum plant give Helichrysum its nicknames as they don’t lose their colour as they dry out and age. Anyhow, I was pleasantly surprised to see Helichrysum starring in a new cream from L’Occitane a few months ago—I happened to read about it in the paper, and saw baskets full of bright yellow blossoms and pretty yellow glass jars displayed at one of their shops. Colour me intrigued. Their 5-patent formula has won awards and much praise for its anti-aging properties. The ingredient list, while very long (51 ingredients! ), contained some good stuff, and some stuff I’d never heard of before, like Echium plantagineum seed oil and Menyanthes Trifoliata Leaf Extract. It also rings in at $114/50mL. Yikes. Unfortunately (and likely by design) all those fancy never-heard-of-’em botanical ingredients are very hard to source. So, I decided a sort of tribute version was in order rather than any attempt of a dupe. I’ve taken some inspiration from the original, and included a few of my favourite skin healing and anti aging ingredients to create a light and creamy facial serum that absorbs quickly and leaves the skin hydrated and happy whilst boosting healing and kick-starting a regenerative party. The basic gist of this serum is that it’s a lotion, but I wanted it to be on the thinner side, so I used the minimum amount of emulsifying wax I could. Every lotion has an oil part and a water part—I’ll start by going through the oil part. The oil part is made up of evening primrose oil, borage oil, black currant seed oil, and vitamin E oil (plus emulsifying wax, of course, though it’s rather uninteresting). Evening primrose oil is a heavy oil, cold-pressed from the seeds of Oenothera biennis. High in gamma linoleic acid, omega 3 and omega 6 fatty acids, it’s a popular oil for skin and hair, and is said to help fight eczema and the effects of aging. Borage oil is a fantastic source of essential fatty acids, vitamins, and minerals. Like evening primrose it’s quite oily, so it works best in formulas like this one, where you can get its benefits without feeling like an oil slick. Black currant seed oil is high in anti-oxidants and gamma-linolenic acid, and is said to increase the elasticity of the skin. And last, but not least, vitamin E oil—a potent antioxidant, it helps with healing and regeneration. The base of the water part is aloe vera juice, a popular healing and soothing ingredient. To that I’ve added some vegetable glycerin for its humectant properties, to help soften and smooth the skin. Up next is some raw honey, which brings enzymes, probiotics, and antibacterial goodness to the party. Then some silk peptides, which are fantastic for moisture regulation and add a nice silky feel to the final product. And last, but not least, is a new ingredient for me—allantoin. It’s a rather unassuming looking white powder that can be derived from a variety of natural things like comfrey, but is usually chemically synthesized (I am ok with this as it can also be derived from urine, and I’d prefer that not to be one of many possible “natural sources”). It’s a wonderful healer—it promotes cellular replication, encouraging the healing of burns and other booboos. Common in everything from lipstick to diaper creme to anti-acne products, it’s safe (o/10 on Skin Deep) and awesome. I’m super excited to have it in my DIY cupboard! 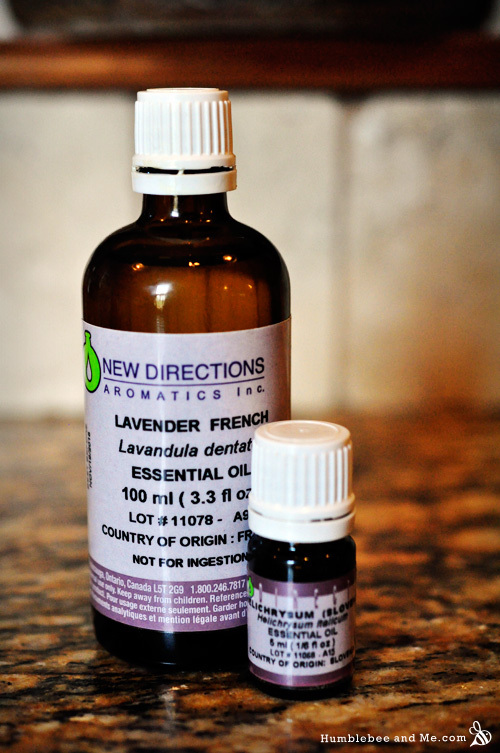 For essential oils I’ve kept it simple—just helichrysum and lavender. 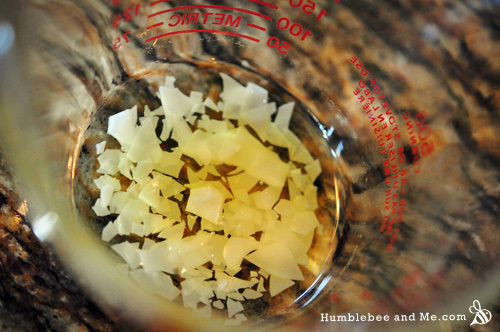 Due to the high cost of helichrysum I make a 20% dilution of it with jojoba oil to stretch out each bottle as far as possible, but this recipe is one of the few places I’ve pulled out my bottle of pure helichrysum for a few precious drops. If you can’t afford helichrysum right now (and I don’t blame you—the market price is really high right now), you can leave it out, and look at replacing it with something like carrot seed essential oil if you’d like. There’s already lots of great anti-aging and regenerative ingredients in here, and there’s no need to break the bank. Weigh the emulsifyng wax, evening primrose oil, borage oil, black currant seed oil, and vitamin E oil into a small saucepan and melt together over medium low heat. While the oils melt, whisk the vegetable glycerin, honey, aloe vera juice, allantoin, and silk peptides together in a small glass measuring cup. Gently heat through and whisk to combine. Once the oils have melted, add the aloe solution and leave on the heat for at least three minutes to ensure everything is heated through and melted. 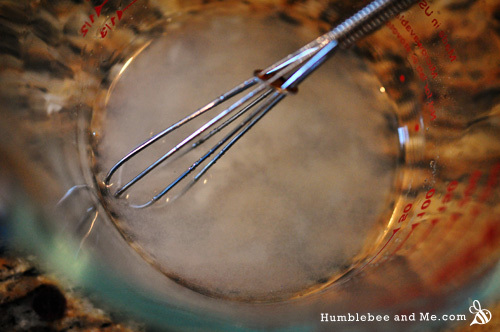 Remove the lotion from the heat and whisk as it cools—it will emulsify into an opaque white solution and will thicken (the thickening may take a few days if you are using a different emulsifying wax from emulsimulse/ritamulse). Once the mixture has cooled, whisk in the essential oils and preservative. Decant into a pump-top lotion bottle. To use, spread a small amount over the face and neck, and enjoy! For packaging I used a 50mL Zelo frosted bottle paired with a dispensing pump. Don’t have the oils called for in the recipe? Check this out. New to lotion making? Watch my basic lotion how to video! Could you use Turkey Red oil instead of emulsifying wax? Thanks! I haven’t tried it, but I wouldn’t recommend it here. It won’t thicken the mixture to a lotion-y texture, and I from my experience it won’t do much at concentrations this low. I’ve found one natural preservative. It’s called NataPres, and it’s available from Lotion Crafter. The the website says that additional fungal and yeast protection may be needed in some formulations. It also says to check out the MSDS for what those formulations might be. I can’t decipher such data, but it’s a decent place to start for a natural preservative. How would you compare this to the Tallow – old skin recipe? BTW…your frosted pump was really hard to find as it was out of stock from ND and Amazon. It would appear black currant seed oil isn’t available 🙁 In doing some reading it would appear that Borage would be the next best thing as a substitute. Thoughts? The link to dispensing pump at the end of this post isn’t working. Can you please post a new link or give the name of the product? Good catch! It looks like they have discontinued that pump 🙁 I have replaced the link with one they still carry. That’s a bummer-really loved the look of the pump! Oh well… wonder why they discontinued it? I actually ended up using Argan instead of the Black Current. I really like the results. Awesome recipe. Also, I don’t want to have to go and buy both black currant seed oil and borage oil? Could this be swapped for rosehip seed oil or olive squalene? Will it have the same anti-aging properties? Since there are such small amounts of allantoin and silk, could they be easily omitted or what are good alternatives? What do you think, Marie? As for the silk and allantoin, you always use them in small amounts—but that doesn’t mean they are insignificant. They’re sort of like salt in cooking. You use a relatively small amount, but that doesn’t mean it isn’t important to the final product. I know of no swap for silk. You could potentially infuse comfrey root in the water part for a hint of allantoin as it’s a natural source of it. Hello! 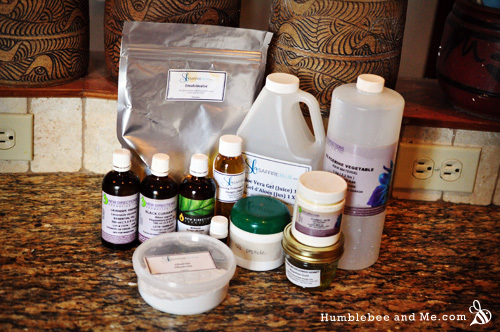 I have just start the adventure of making homemade salves and soaps. I need to find a food grade pure vitamin e for a healing salve. Do you have idea where I can start looking? Hi Tammy! If it’s for a salve it shouldn’t have to be food grade. I buy mine from New Directions Aromatics (links in the big box above the comments), or you can buy food grade capsules from the pharmacy, though they cost quite a bit more. I had the same – I just made it and mine is a little grainy. It was very thin so I added more emulsifying wax but it still seems kind of separated. I didn’t swap any of the ingredients but did get emulsifying wax from NDA UK – could this have been the problem? I’m going to try and use it anyway! It has gotten a little thicker over the last day or so but it’s still separated and I have to shake it up in the morning when I use it. I assume that won’t cause any harm? Also, when it didn’t emulsify properly the first time I added some more wax and put the jug with everything mixed in some hot water to try and incorporate the wax. Will that have made the lotion less effective? I still have a lot to learn about DIY I fear! Everything about that ewax sounds like it should work perfectly in this recipe, but I haven’t tried it myself. I’m not sure why it’s separating on you. Shaking to re-combine won’t do any damage, but you may find the batch spoils faster with the emulsion being unstable. In my experience you can’t save a split emulsion, so it sounds like adding more of the wax didn’t help, but I doubt it hurt anything since you used a hot water bath, so nothing would have got too hot. I’ll be sure to experiment with that ewax if I ever find it! Hi Cari! What emulsifying wax did you use? As for the specks, if they are very wee indeed they might be the allantoin—I’ve noticed it seems to need a few days or so to properly dissolve 🙂 Thanks for DIYing with me! I’ve finally gotten around to making this gorgeous serum. I LOVE it. Really silky and even tastes good thanks to the honey (not that I’m eating dollops of it – just what gets rubbed over my lips!) Who would have thought silk peptides smell so bad? The smallest quantity available was 100g from NDA. Given the tiny amount needed for this recipe, any other suggestions on how I might use them up before the use by date? Why would you need a preservative in it if it contains no water ? I made this serum and it feels awesome, but it is starting to smell weird. I have it stored in a glass pump container and the first few days I used it, it didn’t have much of a smell, but now it smells weird. I can’t even describe the smell, but my nose doesn’t like it. I don’t think it is because it is getting rancid because I just made it and followed the recipe exactly. Could I add more of the EOs to help with the smell? Hi Michelle! It sounds like it may have spoiled 🙁 Rancidity is not the same thing as spoilage… it’s a kind of spoilage, but it can only happen to oils and usually takes at least a year to set in. This spoilage is caused by bacteria having a party in the oil + water blend, and can be sped up by any variety of factors from the cleanliness of your materials to the temperature you store the product at. You might want to consider a broad spectrum preservative in the future if this happens to your lotions often—I like this one right now. So the weird smell turned out to be a rancid smell. Had to toss this one after only a week 🙁 I went through all of my ingredients and they are all in date, stored accordingly, but for whatever reason, it didn’t last long enough for me to enjoy. I didn’t have silk peptide, so I just left that out, everything else was added according to the recipe. Hi Marie! I want to try this recipe so bad, but I got scared about your comment that e-wax would make oily skin break out (I do have that silly oily skin!). Can you recommend another kind of emulsifier that would avoid this issue? Thanks in advance! Hey Ronnie! I’m afraid it is impossible for me to say; shelf life is dependent on so many things (cleanliness, freshness of ingredients, process, sterility of materials, etc). That’s sort of like asking me to predict how long your pet fish might live :/ Keeping it in the fridge will help extend whatever that shelf life is, though. Marie, Have you any face mask recipes for aging skin? Most of the ones I saw focus on more oily types. Mine is dry and in need of a boost. Thanks! Hi Judi! Not at this time. Most clays are going to be drying in some measure simply because clays work by absorbing oils, which is why I always follow a mask up with a serum like this one. Don’t avoid the masks I have up simply because clay is drying—it’s an amazing thing to work into your skincare routine to help revitalize and freshen your skin 🙂 Try looking at some of my more gentle masks, like this one. if i wanted to put in a preservative how much would i put in. I’m allergic to aloe. Do you think I could just use water instead? I made this a couple weeks ago and found it waxy initially. I set it aside because I didn’t really like it, but picked it up earlier this week and started using it again. Its lovely :), goes on smooth and sinks right into my skin. There is very little odour. The only downfall is that I seem to be prone to blocked pores with the use of it which has put me on the search for an exfoliant to try. I will be making this again! Many thanks for all you do, your site is so fun to play on! Hey Connie! I’m glad you’re enjoying this 😀 If you need an exfoliant, I love this stuff (also, wait for Thursday 😉 ). Can rto and gg be used in place of emulsifying wax and preservative if I make in tiny batches? Thanks for your response in advance! You are joyfully traipsing through London right now….hope you are having a fabulous time! Definitely no; read this and this 🙂 If you wanted to make a small enough batch to keep it in the fridge you’d be making about 2 tsp at a time, which is pretty much impossible unless you have Cinderella style mice assistants! Ooohhh, this sounds amazing, can’t wait to make it. A few questions though: I can’t put glycerin on my face for anything, I tried making several face lotions that had glycerin in them and my skin did not like it at all, it made my face super sticky and my pores looked like moon craters minutes after application (and how do I know the glycerin was the problem? 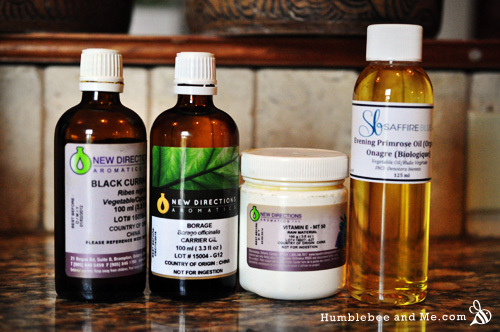 I re-made the lotions without glycerin and had no problem) Could I use another humectant instead of glycerin, like sodium lactate or sodium pca? Also, unfortunately I don’t have borage and black currant seed oil? Could I use other oils that my skin likes, maybe pomegranate, rosehip seed, jojoba? I know I’m veering away from your recipe but I love it and thought maybe I could work it out by swapping some of the ingredients. I own a tiny bottle of helicrysum e.o. and have been dying to use it on a face lotion/serum! Anyhow, thank you again for all your amazing recipes! Sodium lactate would be a good alternative here! It’s not great in hand lotions as it washes off easily, but works well in face lotions since we don’t wash our faces all day long 🙂 You can use all EPO if that’s what you have—they’re all rich in GLA, which is what we’re excited about! I have been making your immortelle for quite awhile and absolutely have loved it. I have run into a problem and hope you can help me. Other than a different brand of emulsifying wax, everything is absolutely the same but my last three batches have been a problem. They came out as always and I put them into the same containers but after a few days, they start swelling and “exploding”. They separate and watery liquid flies out leaving the solids down in the bottom. I am really stymied as the new emulsifying wax works in all of my other products with no problem. Any help you can give me would be soooo appreciated as I really miss my Immortelle. That is… super, super weird. Which e-wax are you using? Which preservative are you using? I don’t know the brand of the emulsifying was as I dumped it into a container and didn’t keep the bag. It was flakes though and not pellets. This works in my body lotion just fine and also in my cleanser but not the Immortelle. I use and have used from the beginning, GSE for preservative. I didn’t have anything else and it has worked forever so just kept doing it. Thanks for working on this mystery with me. Hmm. Well, without knowing what the e-wax is I can’t be of much help there, but I think your GSE may be the problem. GSE isn’t a preservative, so it could be that it’s growing and exploding because of bacterial growth that’s producing gas as a byproduct of the decomposition reaction. I’m not sure why this would suddenly be a problem, but I have found unpreserved lotions made with some e-waxes spoil faster than other, so that may factor into it. Just an idea! I’m guessing it might be something in the wax. 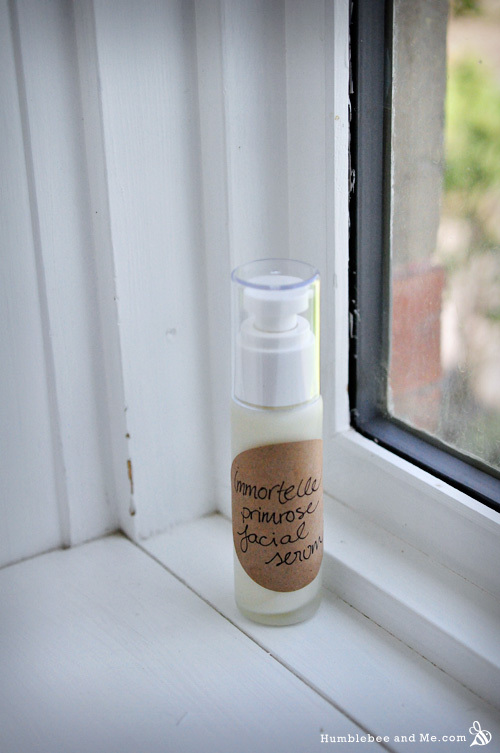 I understand what you are saying about the GSE but that has worked from the beginning of my making Immortelle…..many, many batches so I would be surprised if that was the reason. I guess I have to bite the bullet and order more of the Emusimuse since I had no problem when using that one. Thanks for your input. I know you are very busy so truly do appreciate it. OOOhhh, I made this today and with a few tiny tweaks I got myself a lovely light lotion (doesn’t feel like a serum which is usually more watery) that my facial skin just drank up in no time. I caved in and ordered a small 1oz bottle of each borage and black currant seed oils so I was happy to have them to make this product. The lotion feels surprisingly light (I thought the heavy-ish oils would feel really heavy and oily on my finicky skin), it sinks in really fast and leaves my skin super soft. I used 5g BTMS-50 instead of e-wax for my emulsifier, aloe juice AND witch hazel (for astringency) for my liquid, 2g sodium lactate as my humectant instead of glycerin, 2g hydrolyzed Baobab instead of silk peptides for my protein PLUS added 2g liquid chamomile extract for soothing and calming skin. I have very weird skin… it’s dry, acne prone and it gets angry easily when I put certain ingredients on my facial lotions, like glycerin or some butters. I read on Susan Barclay-Nichols’ Point of Interest! that sodium lactate at 2% in lotions is a great humectant plus can help with acneic skin. I wish I had used a higher molecular weight protein like hydrolyzed oats for film forming but that’s a small detail that I can change with my next batch. Because ooohh yeah, I will be making more of this bad boy, unless my skin reacts badly to the oils or the world comes to and end. I absolutely love this, another winner on my book. As always, thanks so much for all the work you do. How lovely! I’m so glad 😀 I do think lotions are the best way to really get excited about heavier oils—the dilution in water completely transforms them! Your modifications sound divine, too 🙂 I’m loving sodium lactate, too! It’s a pity it washes off so easily, but it’s amazing for face things! 😀 Wooo!!! vegan option to silk peptides? If I were to leave out the raw honey, what should I replace it with? so i’ve made this twice now and it’s split both times D: i thought the problem might have been not whipping it enough as i did it by hand with a whisk first time, but next time round with a high power milk frother it’s still splitting, despite adding 50% more e-wax. it’s so sad watching it turn from a smooth fluffy cloud to a nasty oily mess! but i don’t think it’s that as it’s the only e-wax i’ve been using and everything else has turned out okay. the only other thing i can think of is that i might be messing up the method somehow – once i’ve combined the water part with the oil part i heat it through to ensure everything’s dissolved, but maybe i’m heating it too much? is that a problem, if it gets too hot? help – this smells divine and feels awesome and i so want it to work! That’s Olivem1000; still a newer e-wax for me, and definitely a trickier one than E-wax NF or Polawax. Looking at this recipe I would expect it to work, though—I’ve made similar recipes with similar ratios with Olivem1000 and they’ve worked. The only big difference is that I used an immersion blender, which would kick out a lot more mixing power than a hand whisking or milk frother, so perhaps try that? thanks for the tips, marie. i’ve recently got hold of some btms-25 so i’ll make a batch with that and blend it to see if i have any more luck! out of interest, when you say ‘tricky’, what do you mean? It’s just not as foolproof as polawax or e-wax NF; you have to push those emulsifiers pretty far to break an emulsion made with them, while I’ve found Olivem1000 to be less tolerant of shenanigans LOL. Oh wow! This is the best! 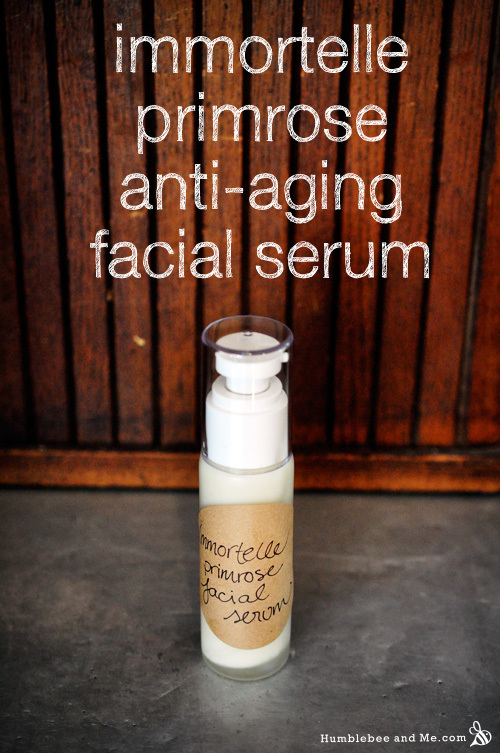 And I laughed when I saw a basically identical facial serum in the store for $90(Australian dollars). And that is for 30ml. Have saved myself a huge lot of dollars. Thanks Marie! You’re so welcome! We must look quite odd when we start laughing and rolling our eyes in beauty shops LOL. I’ve tried to make some facial balms (just oils, butters and essential oils. No watter phase) with Raw Manuka Honey but I can’t incorporate it. It sticks on the bottom everytime…what can I do? 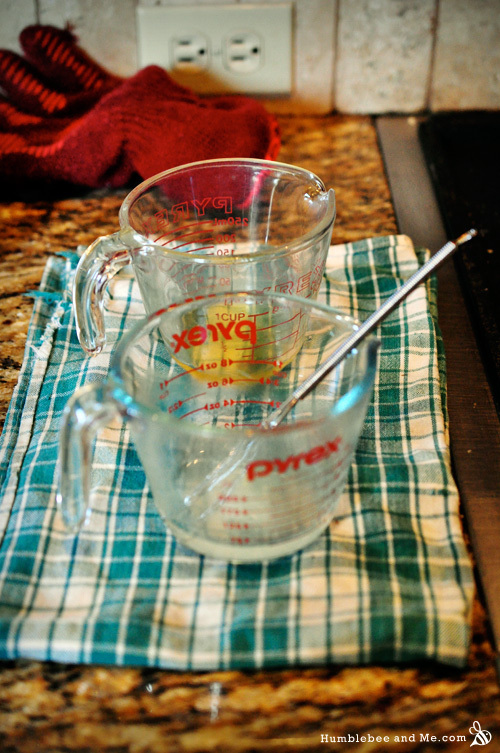 Honey is water soluble, so you do have a water phase, just no emulsifier. You might find this recipe useful 🙂 Honey can be incorporated into otherwise anhydrous things, but the balance of the recipe needs to be enough to stabilize the dispersion. This is similar to a product I’ve been working on for some time so thank you for all the work you put into breaking your formula down! I don’t love the smell of helichrysum to begin with, not a lavender fan, AND those silk peptides are lovely but stinky! 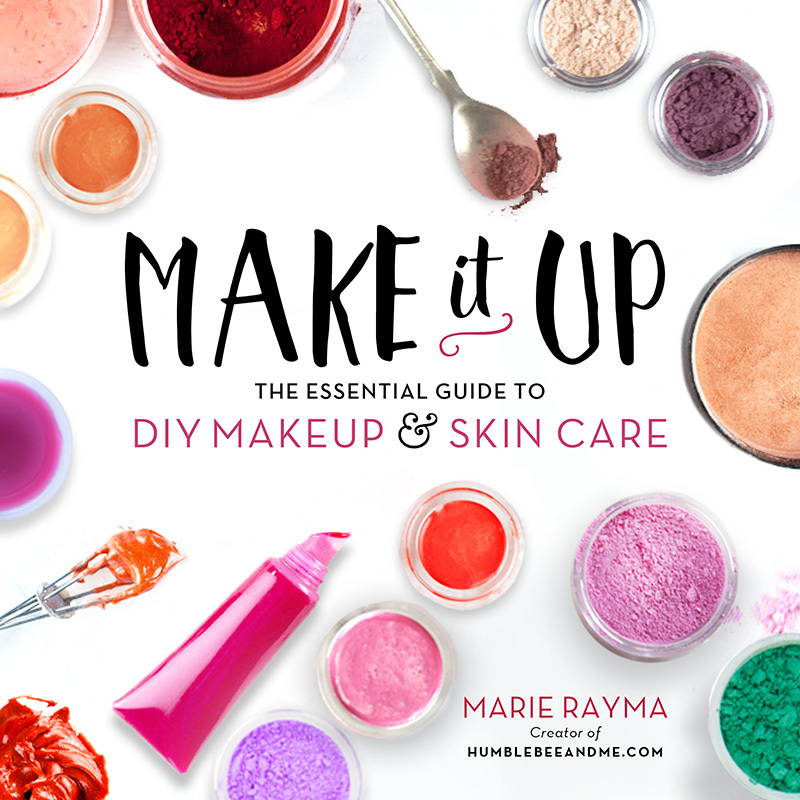 Of course, i’m leaving the helichrysum and silk in because of their great properties for the skin–but trying to figure how to mask especially the silk peptides scent. II noticed there were some forum discussions here on the topic, but no one had a solution. I’ve found the smell of silk peptides seems to vary a lot by supplier—I’ve actually yet to encounter any that smell particularly gross, so I’m not entirely sure what you’re dealing with. I’ve tried the ones from Essential Wholesale, New Directions Aromatics, and Windy Point, and they’ve all been fine. It might be easiest for you to try some different suppliers and perhaps reserve the stinky batch for soap? Thanks so much! I bought these from Mystic Moments and the smell doesn’t transfer to my conditioners and other products I’ve made, so very odd. I think it may be that the scent of the Helichrysum isn’t my favorite and combined with the silk it’s just not working. I’ll change suppliers as well. Appreciate it! Very odd indeed! I’d probably point the finger at the helichrysum combo as well, then—if they’ve been fine in other emulsions I can’t imagine why they’d suddenly stink-fest up here on their own accord, ha!